A report from Everton's win over Leicester City. 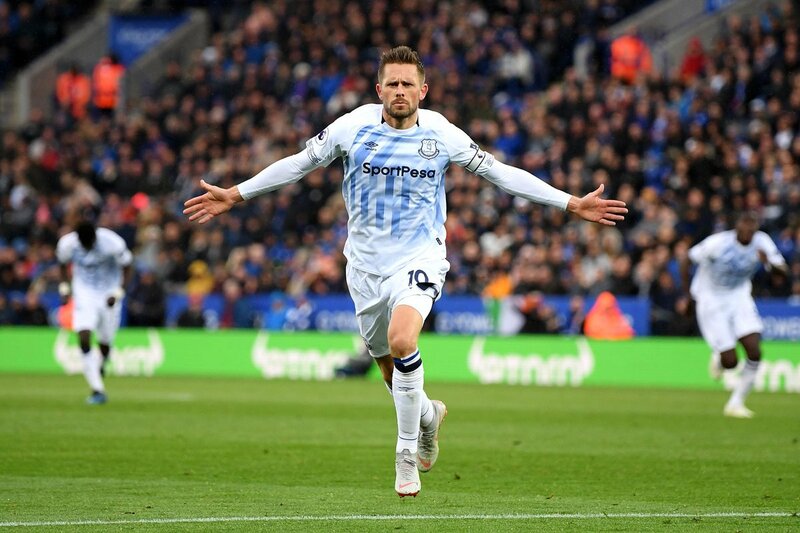 Goals from Richarlison and Gylfi Sigurdsson helped Everton to their first away win in six games, beating Leicester City 2-1 at the King Power Stadium. Ricardo Pereira responded for the hosts just before the half-time break but it was the supreme brilliance of Sigurdsson which wrapped up the points for the visitors. The Blues took the lead inside the first ten minutes through Richarlison. Although the big money summer signing will get the headlines for the goal, it was another Brazilian that made it possible. Bernard slalomed past two Leicester defenders with ease before dinking a deft ball towards the back post aimed for the eventual goalscorer. Kasper Schmeichel was able to get his fingertips to the cross but could only divert the ball into the path of Richarlison who then volleyed the ball home from a few yards out. The hosts responded just as the Blues tried to make their first-half pressure pay. An Everton corner was cleared off the line by Daniel Amartey before Nampalys Mendy, Kelechi Iheanacho and Pereira could link-up to break away on the halfway line. Pereira bore down on goal, turned Jonjoe Kenny inside and out before skewing his shot goalwards, beating Jordan Pickford. However, Sigurdsson snatched the victory with ten minutes to play. The midfielder, a good 30 yards from goal, received a knockdown clearance from Kurt Zouma before Cryuff turning his way past James Maddison. He took a touch which created a few yards of space for himself, looked up and unleashed a dipping effort that lobbed over Schmeichel, giving the Blues the three points. After going ahead in the first-half, the Blues took control of the first-half and could have doubled their lead not long after going ahead. Bernard, making his first Premier League start, created a chance for Sigurdsson to turn home a cross inside the Leicester six-yard box but saw Wes Morgan clear from under his feet for a corner. The Brazilian winger caused trouble for the Foxes all afternoon but the hosts responded well to going behind early on. Everton’s defensive frailties - especially with centre-backs being turned by quicker players - were on full show each time Jamie Vardy was set away. Vardy had a golden chance after outmuscling Michael Keane on a breakaway but couldn’t connect properly with his resulting shot, leading to an Everton goal-kick. Everton’s search for an away win was made slightly easier with half an hour to play as Leicester captain Morgan saw red after picking up a second yellow card. The Blues ramped up their efforts to find a winning goal, bringing on Cenk Tosun to replace the earlier carded Tom Davies. The substitute allowed Richarlison to return to his move natural left-wing role which giving Sigurdsson more space to dictate in midfield. They almost had their second before the Icelandic midfielder scored when Lucas Digne’s long-range effort stung the palms of Schmeichel. After Sigurdsson had scored his goal of the season contender, Marco Silva’s side had a chance to make the final few moments comfortable for themselves but Zouma couldn’t direct his headed effort goalwards. The hosts had an even better headed chance to bag a late point as Amartey nodded a golden effort just wide of Pickford’s post. On the final blast of Andre Marriner’s whistle, the jubilation on the faces of the Everton manager and his players was clear for all to see. Silva’s side will prepare to return to Goodison Park to face Crystal Palace next Sunday whilst their hosts for the afternoon will make a difficult Monday night trip to the Emirates to take on Arsenal.